We’re off on a journey this week, exploring how and when to knit on vacation. Check out this super simple idea to knit your own gadget case in less than an hour! As I sat planning my next adventure, I made a list of all the gadgets I wanted to take with me. Phone, e-reader, tablet. Phone for emergencies, e-reader for obvious reasons, and tablet to store patterns and contact loved ones. I needed to whip up something protective, and fast. My usual flat cases haven’t been known to survive the hardships of checked baggage – at least, not in my experience. 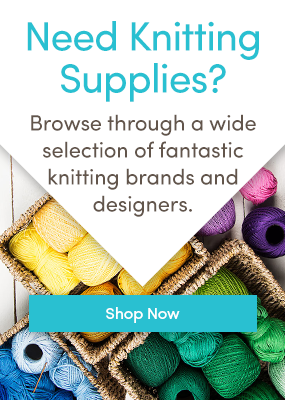 I started off with some Katia Inca super bulky yarn, a wool blend that creates a wonderful squishy case that will protect your gadgets without a problem. I chose shade 121, a gorgeous blend of blues and greens that knits up stunningly. I decided to use US 10.5 (7 mm) needles to give it a nice tight weave. I decided to knit this case in the round, to avoid side seams. If I can avoid seams, I will – no doubt about it. Seaming feels too much like sewing, and not enough like knitting! Below, you will find instructions for how to knit up a case for the gadget of your choice, as well as instructions for how to knit one flat if you’re not comfortable with knitting in the round. Cast on 30 stitches. Knit one row, and join to knit in the round. Continue to knit 26 rows in stocking stitch. Take a moment to make sure your device fits; knit a few more rows if it does not. The amount of rows can vary wildly with tension! Cast off, seam up the bottom. Cast on 15 stitches. Knit one row, and join to knit in the round. Continue to knit approximately 20 rounds in stocking stitch. Cast off, seam up the bottom. Cast on 45 stitches. Knit one row, and join to work in the round. Carry on knitting in stocking stitch for approximately 40 rounds. Cast off, seam up the bottom. Warning! Your mileage may vary due to tension and yarn choice. Make sure you check your case against your device occasionally, and adjust accordingly. Divide the cast on stitches by half, and double the rows knitted. For example, you would cast on 15 stitches, but knit 50 rows, for the 5 inch device. Where are you headed this summer? Tell us in the comments – and tell us what you’ll be knitting to prepare! Last updated: August 3rd, 2015. 5 inch? What if your kindle is a 6 inch device? Aside from that – great article ?? If your device is 6 inches, I reckon you would probably need to cast on 35 stitches, and knit about 30 rows for that to fit. Hope that helps, happy knitting! I made a case for my lg g4 phone, I used bulky yarn and size 8 double pointed needles, Judy’s magic cast on (24 sts) and worked in the round. Finished 2 rows garter stitch and a picot bind off. No seams, just ends to weave in. This was a nice little fun project. Very cute. Thanks for posting it. I wanted to add that since you say you dislike seaming you could start at the bottom with a cast-on like those used for toe-up socks. This would result in a closed bottom without and seaming. Whoops. I just saw that Susan said the same thing about no seaming (only better!). Anyway my comments about the project being a nice one still stand!